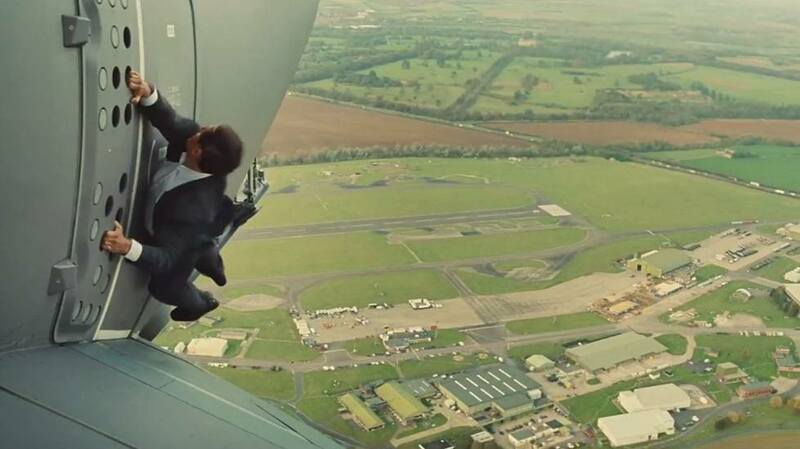 The impressive "hangs onto a plane" stunt from Mission: Impossible Rogue Nation. Tom Cruise’s desire to be James Bond really gets the better of him in M:I5, a flabby action spectacular which has visited Vienna, London, Langley, Paris and Havana within its first 20 minutes or so, right after the pre-credits sequence which sees Jason Bourne, hang on, Ethan Hunt clambering onto the outside of a cargo plane as it’s taking off. A stunt done for real, we’re told, and impressive whether it was or wasn’t. Christopher McQuarrie wrote and directed, so there’s plenty of that “who is the real bad guy?” attitude that was the making of The Usual Suspects, but here is just another muddying trope in a pool that’s never less than opaque. Simon Pegg is used as a motormouth explication device to such an extent that you start to feel sorry for him, with no action set piece getting the green light until Pegg has first talked us through it. Still, Rebecca Ferguson is impressive as the sort of badass babe Bond would do well to hire – when she kicks you, you stay kicked. And the support cast is excellent – Simon McBurney, Sean Harris (an excellent baddie), Tom Hollander, Alec Baldwin. As well as the opening sequence, there are plenty of big bucks set pieces – swimming into the water-filled torus of a power station was pretty cool – and at one point a car chase through the streets of Casablanca is immediately followed by a bike chase, so action fiends won’t feel short-changed. Plot? The usual disavowed – reavowed schtick. In Ted 1, loveable stoner Mark Wahlberg found a buddy in a talking toy bear who shared his sofa-surfing habits and babecentric worldview. Ted 2 picks up the bromantic plot at the point where Ted is about to get married to leggy babe Jessica Barth, only to discover he legally can’t because… he’s a bear. The rest of the film is a quest to have Ted’s rights affirmed, while over on the bad-guy side of the ring Giovanni Ribisi and John Carroll Lynch work against him, so they can have his magic innards and sell them to Hasbro (I do hope Hasbro’s lawyers were in on this joke). But never mind all that, this is a Seth MacFarlane film and so what it’s really about, in Family Guy style, is gags. And this time out MacFarlane’s intention appears to be to out-Airplane! Airplane!, because they keep on coming – jokes about Kim Kardashian, chicks with dicks, mega-powerful skunk, one involving Liam Neeson in “very special set of skills” mode, one about the opening credits to Law and Order, one about the Germanwings plane crash, and of course Darth Vader and Obi Wan Kenobi turn up as MacFarlane shifts the focus to Comic Con, a setting that he (if he were someone else) might have built the entire film around. Amanda Seyfried provides love interest as the punchy lawyer hired by Wahlberg to regain Ted’s rights, and even in a film this insubstantial she turns on the magic – the romance works, even among the knob gags. But. Was it me or is MacFarlane’s grasp of popular culture just beginning to drift? He’s over 40 now and the Star Wars stuff is beginning to wear thin. Are younger people really that interested? Either way, this is a funny and entertaining film, though one probably best enjoyed with a bong. 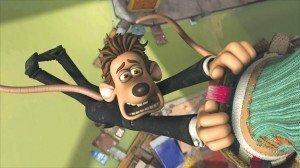 The big “Pixar are great… But” caveat has always been their focus on the mechanics and physics of the real world. Remember those early films where they’d go on about the amount of processing power it took to render hair? In computing terms, it was a great achievement, but they got a bit hung up on it all, leading to what might be typified by Cars – lots of whizz, little fizz. In Inside Out it’s clear that Pixar have now worked through that phase, because here the images are in the service of the story, and if fantasy is required, then fantasy it shall be. Its action takes place inside the head of a young girl called Riley, where little avatars of Joy, Sadness, Anger, Disgust and Fear work relatively harmoniously as they control her psyche. Mostly, Joy is in charge, and (cut to external world) we see that Riley is indeed a happy young girl. Then, one day, Riley’s parents move house, and this external event has an internal knock-on. Riley is sad, and Joy temporarily loses control of her and in a rush of events, she and Sadness are sucked away out of the Star Trek bridge (which is what it looks like) down into Riley’s unconscious mind, leaving Fear, Disgust and Anger in charge – Riley is plunged into depression. This interdependence of the emotions – all presented as positive and necessary for mental health (Anger isn’t just angry, he “cares very deeply about things”) – is what makes this film remarkable, and its idea of the human mind as a site where Freud’s primal drives and the more modern mind-as-computer might be duking it out reflects Pixar’s own artistic journey. Down in the unconscious, where unlikely buddies Joy and Sadness embark on a road trip, we see workers deciding on which memories to delete, to make room for more. They’re joined by Bing Bong, the imaginary friend Riley has grown out of and forgotten. Broccoli, grandma’s scary vacuum cleaner and the stairs to the basement all loom large down there too, as does a murderous clown. There is much imaginative fabulousness, in other words, before order is finally restored. 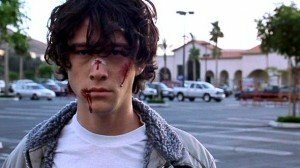 However, strange as it might seem, the journey itself – the road trip to a happy end – is just kind of a bit “meh”. Jake Gyllenhaal goes down the Christian Bale route of Modern Method Madness, putting on a lot of muscle to play world light heavyweight boxing champion Billy Hope, a man who has it all – lovely wife (Rachel McAdams), house, kid, money, title, acolytes, a mile-a-minute manager (50 Cent, good for a change, and looking fly in a snap brim hat) – only to lose it, then win it all back again. Southpaw makes claims to being more than the boxing movie you’ve seen before, aiming for depth with its maudlin tone – gloomy “spheric” music (as the subtitles called it), deliberately dark looks (the director Antoine Fuqua’s usual style), some really decent acting talent in the shape of McAdams and Forest Whitaker, as the sage old boxing head who will mentor our man back to glory from a backstreet gym that stinks of liniment and urea. It also claims to be the portrait of an angry man’s emotional development, though it isn’t sure on this point – is Billy’s impressive run of success down to his fanatical rage (which is what the plot tells us), or his ability to soak up blows in rope-a-dope style (which is what Gyllenhaal and Fuqua show us in the many boxing scenes). Which is it? Both, it seems, a decision that makes no sense emotionally. What is this man’s arc, what is he travelling away from? This indecision about Billy Hope’s character leaves a huge hole where the story should be. And explains why a film that deals with death, a child separated from its father, aggression in the ring and triumph over disaster has no emotional resonance whatsoever. FW Murnau’s Nosferatu, his version of Bram Stoker’s Dracula, has been restored before, and without having done a side-by-side analysis, I’m tempted to say this one has the edge. Even so, highlights are still bleaching out here and there, focus is lost now and again, there are still longitudinal scratches from the print having run through projectors too often and grain has visibly been added back in digitally to satisfy wholefood fans. New intertitles have been made too, using the same text as the original, and they’re nice and crisp. Most importantly the film comes with Hammer veteran James Bernard’s score, an appropriately orchestral piece full of Wagnerian horns and growling deep strings, which really helps bring the film alive. It’s the same film, of course, but watching it again, I was struck again at how much of it has been reused in other films, especially by Hammer in their various vampire efforts. The stagecoach racing through the night, the scene at the inn where the locals recoil when Hutter (ie Jonathan Harker) tells them he’s off to visit the count, the arrival scene at the castle where the count feeds and waters his guest while eyeing him like a juicy steak. The film is over 90 years old, and its power to shock or horrify has gone – “Parental Guidance”, says the certificate. But it’s still creepy as hell, particularly Max Schreck’s Nosferatu, the long nails, the ratlike teeth, the cadaverous face, the frock coat over a wiry frame. Shreck is also very light on his feet, yet in the scene where he carries his own coffin under one arm through the empty streets of the German town he’s about to make his new home, seems to be effortlessly strong too. I was also struck by Murnau’s love of a framing device, as if he were still thinking in terms of theatrical proscenium arches, though on the other hand his various digressions into natural history – a hyena here, a venus fly trap there, a polyp with its waving tentacles – suggest that his old-fashioned touches are deliberate, part of the gothic atmosphere he’s cooking up. Also evident is the fact that Murnau is precisely aware of how familiar his audience was with the story he’s telling – very – which means he can deal in atmosphere and theatricals (the shadows up the wall, that amazing pivot that Nosferatu does from out of his coffin, still the most remarkable sight, in spite of it being obvious there’s a plank wobbling behind him). Such a skilful film, such a work of expressionist beauty and sheer technical artistry. It still holds up. Oliver Hirschbiegel made his name with the spectacular Hitler’s-last-days drama Downfall, unmade it with the Diana’s-last-days drama Diana and now returns with a perhaps fitting combination of the aggressive and the passive with 13 Minutes, a dramatisation of the little-known case of George Elser, the German who tried to assassinate the Fuhrer 8 November 1939. Hitler wasn’t around when Elser’s rather neat, but devastatingly effective bomb went off, having cut short a rally so as to get away sharpish before fog made take-off for his plane impossible. Elser’s bomb missed by 13 minutes. Hirschbiegel is an expert at the period setting, and though the story is ostensibly about Elser’s arrest and interrogation by the authorities, in fact his film is all about the sort of Germany that existed for normal people as Hitler rose to power. Much of it takes place in flashback, in the early 1930s, where the young pacifist Elser’s routine of flirting with girls, swimming at the lake and working at the steel foundry is broken by his increasing conviction that something must be done about the nasty demagogue and his adherents. In between shots establishing the period, we glimpse many “normal” Germans who aren’t particularly keen on Hitler, yet stand back and let him have his head. This aberration took over somehow, is the idea, rather than the more usual one, of the Germans clasping Hitler fanatically to their bosom. The film is a salve specifically for a nasty German wound. So it’s revisionist? A touch. But more problematical is that it lacks drama – passivity is hard to get worked up about, in a populace but especially in a hero, and even the torture scenes carry no charge because we know that Elser operated alone, so there’s no list of collaborators for the torturers to drag out of Elser, no matter what they do to him. All in all a muted, unshowy film, beautifully made, carriage clock stuff. Expect no explosions. A stranger arrives in town, looking, it seems, for someone. He is promptly beaten up, stabbed and left for dead by the town bullies, then is taken in by a local teenager and his fearful mother. Chief among the bullies is the son of the local cop, who is himself no stranger to fisticuffs and worse, if the situation demands it. But the stranger is no ordinary man. In fact, we realise after a short while, he’s some sort of vampire, but a decent sort, unlike almost everyone else he encounters in the village. From Chile, this transplantation of the Nordic Noir style to the southern hemisphere (posing as Canada) works almost entirely, with The Stranger turning out to be something of a Let the Right One In – a muted, guarded horror story, in other words, though director Guillermo Amoedo’s love of visceral horror shows through. If it can be stabbed, burnt, flayed, shot or oozed all over, it’s in this film. The very good make-up effects, soundtrack and camera might suggest that Eli Roth, the film’s producer whose name adds “Eli Roth Presents” splendour to some of the publicity material, has drafted in some Hollywood help. But no – Chechu Graf is cinematographer, music is by Manuel Riveiro and makeup effects are by Lorena Molina, all of whom have Chilean cinema CVs. Roth, if he’s going to continue the association (and he should) might encourage writer/director Amoedo to use the service of a script doctor next time – some of the dialogue is weak. And a casting director – the acting is very wobbly, belonging to the Lifetime/Hallmark school of cut-out performance. But the story and the idea behind it is strong, and that’s the main thing. And if you wonder why I’ve not said much about the plot, it’s because that’s one of the joys of this film, finding out how far its characters deviate from cliché. Which they do quite a bit. Amoedo is a name to watch.